Sometimes you post a message to the wrong project. Fret not! Just move it where it needs to go. Watch this 📹 video to learn more! Go to the item you want to move: You can move discussions, files, to-do lists, text documents, and forwarded emails. Single events can be moved into new projects, but recurring events can't. You're not able to move comments or files attached to comments. Admins can move anything; non-admins can only move the items they've created. Click "Move," on the right. Choose the correct project from the drop-down. (You can also start a brand-new project from here!) Items can only be moved into projects you have access to. 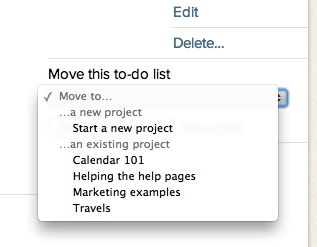 Click the "Move this to-do list," and away it goes! 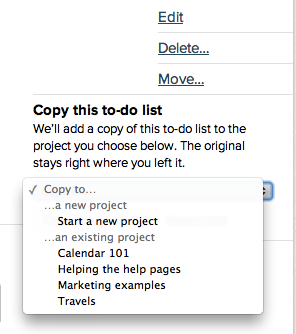 You can move an individual to-do by clicking on the to-do item, then clicking Move. You can choose the project and the list it moves to. Make sure the item's new home has an open to-do list, otherwise it can't be moved. You'll then see the option to move that file. 6. 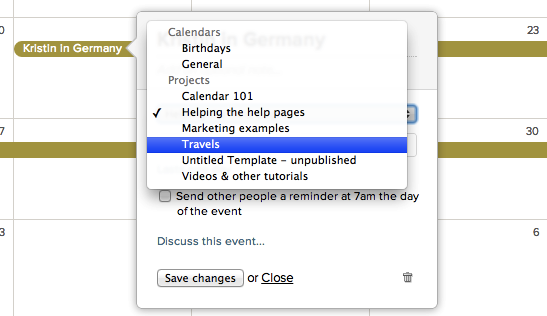 To move a calendar event, go to your Calendar page, click the event, and pick the new project from the drop-down menu. Basecamp will do the rest! Want to reuse that list or message without retyping the whole thing? Copy it! Go to the item you want to copy: You can copy discussions, files, to-do lists, text documents, and forwarded emails. Single events can be copied from the Dates page, but recurring events can't. You're not able to copy comments or files attached to comments. Admins can copy anything; non-admins can only copy the items they've created. Choose the correct project from the drop-down. (You can also start a brand-new project from here!) Items can only be copied into projects you have access to. Click "Copy this to-do list" to confirm. 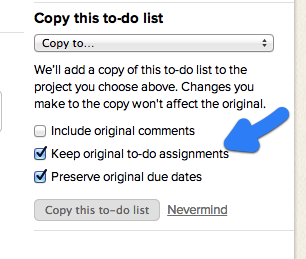 Assignments and due dates can be preserved in your to-do lists, or removed if you prefer. Basecamp can also remove comments, and copy just the original post. 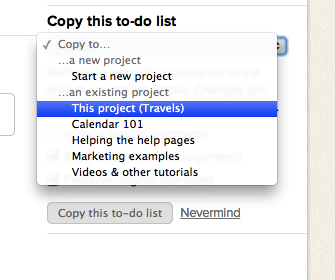 You can copy items in the same project to make a duplicate. It's perfect for re-using to-do lists! Just select "This project" in the dropdown menu.